Hungarian Vizsla Forums > General Vizslas > Training & Behaviour > Should I get a vizsla when I have 2 little kids and a reluctant husband? Should I get a vizsla when I have 2 little kids and a reluctant husband? Hi All. I just joined the forum. I have wanted a Viszla for years and seriously considered it last year but decided to wait awhile longer for my kids to get a bit older. I am a stay at home mom. My sons are now 2.5 and 4 years old. My oldest will start school next September. We live in a large house on 1 acre of land on a dead end street with access to hundreds of acres of woods across the road. I am a long distance runner and love the outdoors. Right now I run for 1 hour, 3-4 days a week but that distance increases as I train for half marathons. I go walking/hiking with my sons twice a week. I bike once a week in the summer too. Snowshoe in the winter. So I am confident I can exercise a vizsla enough, even if that means getting up at 5am to walk/run before my kids and husband get up. I have to be honest and say that my husband doesn't want a dog. We had a retriever mix for 11 years. My husband was the one who had to bring him to be put to sleep when he started having seizures from a brain tumour. It really hurt my husband and he said he would never have another dog. Before that though, we both got very stressed out when our kids were born and the dog barked all the time and woke them up. So he still has that fear of being overwhelmed with a dog in the house again. At that time, our dog was not getting exercised at all so I know that led to issues. I used to be a couch potato but am completely different since becoming a runner in 2013. My husband said I can get a dog if I want but he doesn't want anything to do with it. I think he will change his mind and will become attached to the puppy, he just doesn't want to consider that now. So all of the training and exercise will fall on me alone. I've been reading some threads and am worried about the shark attacks? If the dog bit my kids, I don't know what I would do. My boys are very rough and tumble kids, they wrestle and fall down all the time. So I know they could handle being bumped/knocked down by a dog. But I am very concerned about the potential for biting. Also, We are spending a huge amount of money renovating our kitchen which includes putting down hardwood floors. My husband is worried that the dog would ruin our house. Will the floors be scratched if the dog's nails are kept short? I have read tons of dog training books, I've read a lot about vizslas, I've had dogs all my life. I will be staying home with my kids for another 2-3 years so I feel like I would have a lot more time to deal with puppy behaviour now but now also means that my kids are little. I have been talking with a professional breeder of competition winning vizslas. She will have puppies available in February. So please, lay it on me. I would love your honest opinions. Thank you. 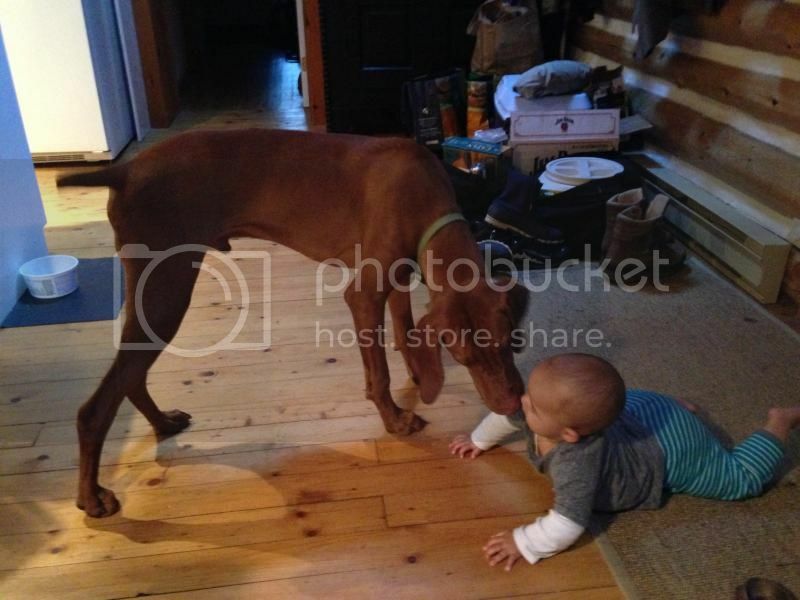 Re: Should I get a vizsla when I have 2 little kids and a reluctant husband? There is a post "I read they were good with kids" in the index. Take a look. You are active enough to burn off the energy but can you focus on what a hunting dog needs? If you get a Vizsla from competition stock it will have uber energy. My suggestion is let members here know what town you live in. Maybe someone has a Vizsla they could let you "borrow" for a weekend. Do a little house sitting for a weekend with husband and children and see how it goes. Your first part of the story was perfect. NEVER get a Vizsla unless EVERY member of the family buys in. My oldest daughter will not bring over her 6 and 3 year old sons unless I put the dogs in another room. They just are too rough. They don't mean to be, they just are. If you lived in the East Bay of the San Francisco Bay area, I'd let you borrow Bailey and Chloe for a weekend. Happy trails. I am sure others have opinions. Secondly hold back on the hardwood flooring..... it will get ruined!!' ( get a rug/s)!!! My kids were rough to when young, but I don't know that they would have held up to the shark attacks that my puppies dished out. Funny story that I don't think my son would like me telling. He was 12 years old at the time and my puppy was full of piss and vinegar when young. He called me on the phone and said Cash (puppy) had him trapped on top of the recliner. Cash was just in a crazy play mode, but that meant nipping hard enough to make blood blisters, and rip cloths. I could hear Cash in the background barking. I laughed and told him "Get down off the recliner, and put the puppy back in the crate." I have seen dogs ruining couples! When they are perceived as intruders or when the partner have the feeling he is not being considered. So...I know you can change his mind!! As for the kids:Leo met a two years old last w-e and for the first time in his 6month life ,took care not to jump on someone!he was sweet and gentle but we never let them out of sight. I find the experimental w-e a great and generous idea!You could embark your young family in this adventure and see if they feel like living it for 15 years! Gosh! What a question! As a loving v owner I'd say "go for it, your hubby will come around!" But the fact that some Vs end up for adoption says otherwise (for any number of reasons of course). .... But I honestly wouldn't be able to have a V without my spouse's help. I'm a social being and knew that I was sacrificing almost all my "me time" by getting a V but you just don't know what that truly means til you have one, eh? Sometimes I call Dave and ask him to come home to walk Nico so that I can go for a solo run just to experience that "me time" again! I can't go back now (or ever probably) because I love the Velcro dog too much but I can't deny that it's taxing! As a funny anecdote: I was the v fanatic & Dave was the hesitant one before we got Nico... And just now when I read the title of your post out loud he said "Yes. That's all you needed to post, why did it take you so long to type 3 letters?" But think about it for yourself!! Good luck! Before we got our pup, my husband was of the mindset that he was never ever having another dog. He had dogs previously, and didn't want to be tied down that way again. One day he caught me looking at a rescue dog online, which sparked the conversation of us potentially getting a dog. When he realized that I really wanted a dog, he reluctantly started discussing breed options (his previous dog history being lab mixes and a malamute). We began researching and decided on a V.
Even though my husband ended up agreeing with getting the dog, he told me that the responsibility of the dog was left entirely to me - toilet training, obedience, walking, etc. Though my husband loves our dog, these tasks still fall to me. Over the past year and half I have gotten used to getting up at 5 am with the dog to play and exercise. I come home at lunch to again, play and exercise the dog. After work, it is the same thing. I have taken the dog to obedience classes, and now agility classes. I do not have kids, and honestly *for me* I don't think it would have been possible to do what I have with our pup, and still look after the two kids - unless my husband were to take sole responsibility of the kids, while I look after the dog :P In addition to training the dog, you will also need to train the kids in how to deal with the pup (which may be harder than training the dog :P). However, if you want something bad enough, and commit to it, you can accomplish anything! Your a mother of two, so your likely more patient and used to lack of sleep than me. My friends and family (most who have or have had kids) tell me that my dog is needier and higher maintenance than a kid. I don't know how much exposure you have to the breed, but RBD's suggestion of finding some Vs to hang out with and/or borrow is an excellent suggestion to see if a V would be a good fit for your family. You know your family best, and what your capable of - Goodluck! C-E struck a couple of notes that resonated. Our first dog was my wife's idea and responsibility. But it didn't take long for me to come around and it's possible that your husband might too. I'm not saying to count on it, but it could happen. A potential problem with kids is not just that they'll get knocked down by a dog, or be subject to shark attacks. The other, bigger, problem is that they can unintentionally provoke a dog into biting. I adopted my Charlie from a breeder after he had been returned for biting kids (twice). Charlie is NOT a biter, but the kids pushed him too far and he did bite. It's a matter of training the kids. Our previous 2, of 16 years each, were not destructive of the hardwood floors, which were of no special kind. YMMV, of course. Yours is a tough call and for most tough calls I recommend going with your gut feeling. Do your research, but don't try to analyze too much.